A production version of the New Compact Coupe concept could join a sedan and wagon in the Jetta lineup. DETROIT -- Volkswagen AG has gone public on plans for a coupe variant of the next-generation Jetta with the unveiling of a near-to-production-ready concept at the Detroit auto show. Dubbed the New Compact Coupe (NCC), the new two-door previews the look and mechanical layout that Volkswagen plans to adopt on a new front-wheel-drive model to be built at its Puebla plant in Mexico as part of ongoing plans to further penetrate the U.S. market. 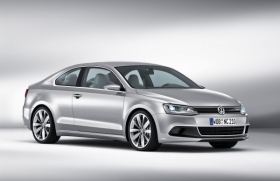 Conceived primarily for North America, which does not receive the Volkswagen Scirocco coupe owing to the high cost of importing it from Palmela, Portugal, where it is assembled alongside the Eos, Volkswagen says a production version of the NCC could also be sold in other key markets as part of the sixth-generation Jetta lineup, which will also include a similarly styled sedan and station wagon. The four-door sedan version of the new Jetta goes on sale in North America and Europe later this year. All three future Jetta models are expected to share the same edgy styling and detailing revealed by the NCC. However, the upcoming coupe is set to have its own unique front-end design, a faster windshield angle, frameless doors and widened tracks in a move similar to that used by BMW in differentiating the 3-series coupe from its four-door sedan sibling. "We didn't just want to put two doors on a Jetta. Buyers expect more from a coupe these days. The changes are subtle, but they help provide the NCC with its own visual flavor," said Klaus Bischoff, head of Volkswagen brand design. The NCC's drivetrain provides the first clues to how Volkswagen plans to add a gasoline-electric hybrid option to selected volume selling front-wheel-drive models, including the Golf and the Jetta, from 2014 onward. At the heart of the new two-door is a transversely mounted supercharged and turbocharged 150-hp, 1.4-liter, four-cylinder gasoline engine. The direct-injection unit is supported by a brushless electric motor integrated into the transmission within the left-hand side of the engine bay. With 27hp, it draws electricity from a 1.1 kilowatt/hour lithium ion battery housed in the floor of the trunk to boost the NCC's overall output to 177hp. VW has engineered its new hybrid system to allow electric-only propulsion, albeit for short distances owing to the small capacity of the battery. In electric mode, the gasoline engine not only shuts off but is also disengaged by the clutch to reduce mechanical drag in a so-called "coast down" mode. VW says the compact coupe's hybrid powertrain uses only 4.2 liters of fuel per 100km (45 U.S. mpg) with CO2 emissions of 98 grams per kilometer.